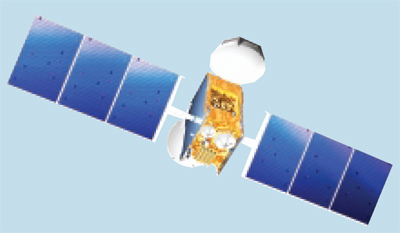 GSAT-10 is a 3-axis body stabilized geostationary satellite based on ISRO’s I-3K (I-3000) bus to provide communication services/augment the existing services. It carries 12 Normal C-band, 6 Extended C-band, 12 Ku-band transponders along with GAGAN (GPS Aided Geo Augmented Navigation) payload. The lift-off mass of the satellite is 3400 kg and it generates 6.0 kW of Power. The satellite will be located at 83ºE and will have a minimum operational life of 15 years. The satellite was launched on board Ariane-5ECA in September 2012.